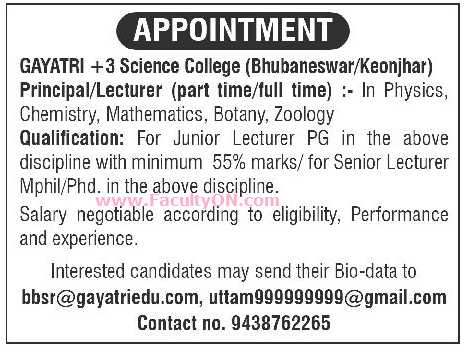 GAYATRI +3 Science College, Bhubaneswar has advertised in the SAMAJA newspaper for the recruitment of Teaching Faculty- Lecturers / Principal jobs vacancies. Interested and eligible job aspirants are requested to apply immediately from 30th July 2018. Check out further more details below. About College: GAYATRI RESIDENTIAL COLLEGES are managed by group of trusts.It is the No.1 +2 Science College in Bhubaneswar, Odisha. The main aim of the trust is to facilitate education through residential facilities to the local students as well as the students of Odisha for receiving the basic need of educational value with scientific way.